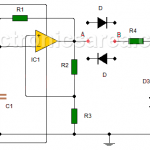 How to make a Light Sensitive Sound Generator Circuit? 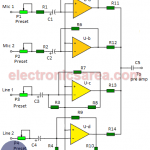 An oscillator circuit may have many applications. 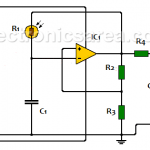 The diagram below shows how to make it work as a light sensitive sound generator using a LDR and a 741 operactional amplifier. 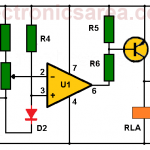 4 operational amplifiers, some resistors and capacitors to implement an audio mixer with a very simple design. 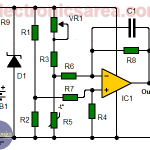 This temperature to voltage converter circuit, convert the sensed temperature by a thermistor into a voltage level. 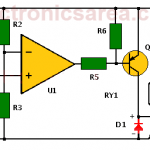 Over-temperature alarm using operational amplifier. 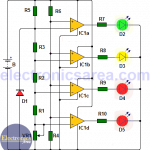 This over-temperature alarm circuit uses a common semiconductor diode as a temperature sensing element. 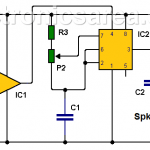 This 12V Power Supply has, as its main characteristic, a low output impedance. 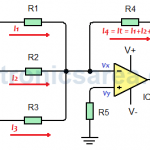 This is a very desirable feature in voltage sources and is achieved with a large open loop gain that the operational amplifier has.